I had been dying to make a clock for a long time, and my original plan was to make a sunburst clock. 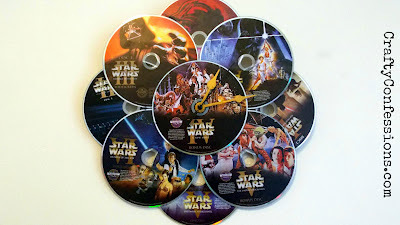 That is still on my to-do list, but when I saw my lonely little Star Wars DVDs I knew what I had to do. This will work with any CDs or DVDs and makes a great addition to your movie/TV area. Separate your discs into 2 sets of 5. Arrange them as shown below and glue them in place using E6000. 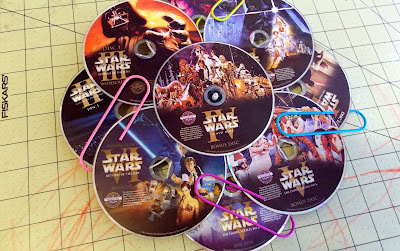 When arranging your discs make sure the front sides are where you want them before you glue. The outer set of discs will have one disc the sits on top of the others. Make sure this is straight! 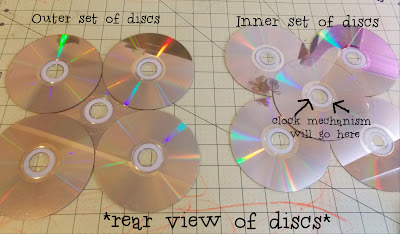 The inner set of discs will have one disc behind the others. The mechanism will be mounted to this disc so make sure it is on the underside when facing forward and on the outside when facing the back. See the photos for reference. 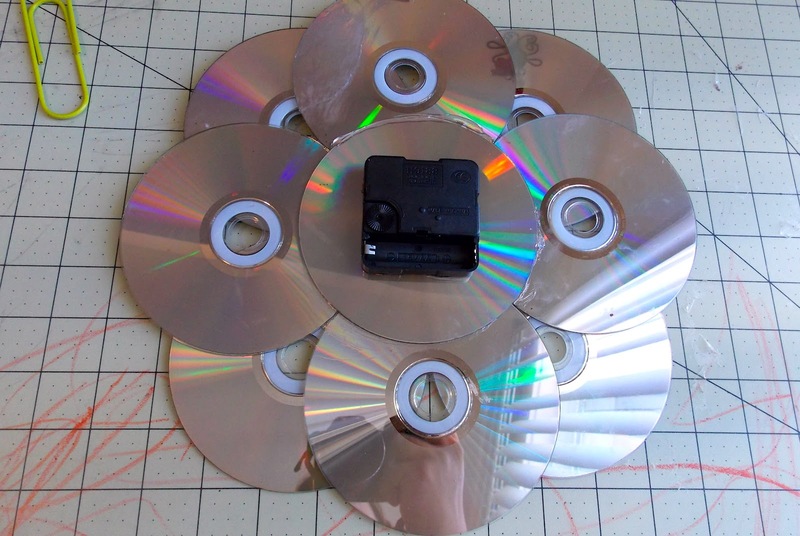 Stack the outer set of discs on top of the inner set of discs. This will be how the front of your clock looks so make sure everything is straight. Glue sets together with E6000. Can you tell my toddler got a hold of the crayons?? Now it is time to attach the mechanism. Glue the mechanism to the back of the inner set of discs as shown. Allow it to dry before flipping it over. Once the glue on the clock has dried flip it over and slide the clock hands into place. You can display this on an easel or hang it on the wall by gluing a soda can tab to the back of the mechanism. What discs will you use to make this clock? How awesome is this?! My Star Wars/general film nut sweetheart would love to have this our dream movie room. Thanks for posting at the Bacon Time linky party! Following now and looking forward to more crafty goodness from you! Great read. I recommended to all my friend too!